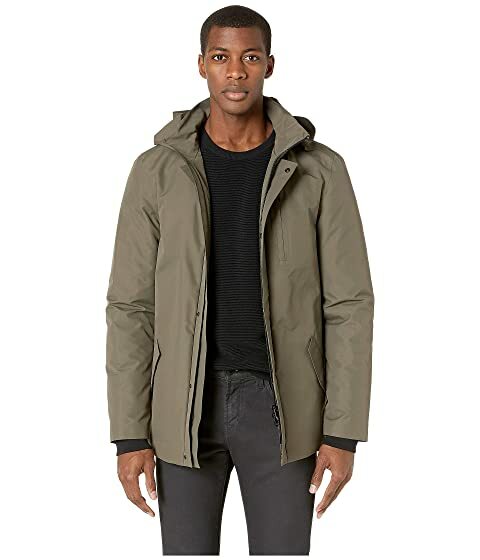 Get through rough weather with the ruggedly handsome style of the MACKAGE® Shawn 2-in-1 hooded rain jacket. Double placket features hidden zip and snap closures. Flap snap pockets at waist. Fabric is water-repellent and water-resistant. Outer shell features sealed seams. Comfort zone down to -10°C / 14°F. Removable down liner and rib cuffs. Fill materials: 90% duck down, 10% feathers (Ma Duck, Tadorna Tadorna). Dry clean by a leather specialist using oil-based solvent only. Do not use perchloroethylene. We can't currently find any similar items for the Shawn by MACKAGE. Sorry!